I wanted to write this letter as soon as I came back from the Golden Globe ceremony and the meeting with Los Angeles film critics where I was present with you and our film. However, I was so busy preparing my first film, Snow on Pines, that I couldn’t do it. When my film received the Audience’s Choice Award in the closing ceremony of Fajr International Film Festival, I remembered you; you who have always known, and still know, the value of your homeland, our homeland. I told myself, it is time to write this letter especially as we were just 10 days away from the Academy Award ceremony. I will tell you what is the relationship between that ceremony, that remembrance, and the value of people and their views. A visual error of us, humans, is that when we see something from close range, we do not generally appreciate its grandeur. The recent trip and new experiences that I gained by seeing and hearing reactions to “A Separation” with you, have greatly helped me to avoid of making such error. 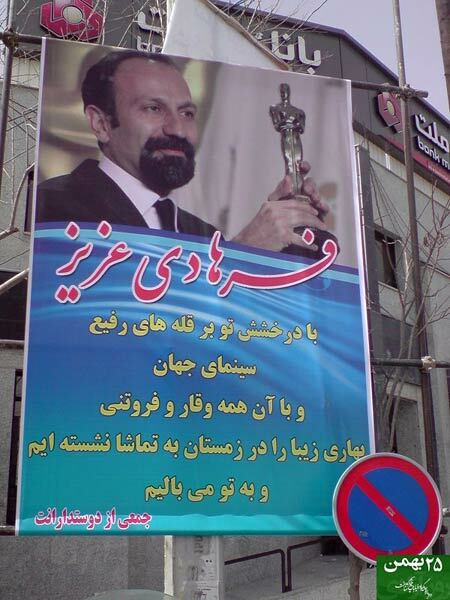 I am sure that many Iranian people will be delighted after reading about these reactions, especially at a time that a certain group is trying to make a connection between the film’s success and politics on imaginary grounds. This is enough motivation for me to write and publish this letter. In the early leg of the recent trip, when Mahmoud Kalari was accompanying you in eastern parts of America and was witness to appreciation given to the film by New York film critics, he called to tell me that the film is in for a very singular experience. I was really amazed. Kalari said the main point was that we have lived with cinema and have been watching films and film ceremonies for long years; now we tell ourselves that we are going to see some big names in such ceremonies. Out of a sudden, we came to realize that this time it is them who are waiting to see us! This is the property of big films. Past experiences, of course, decrease the amount of amazement or excitement that usually accompany such reactions, but never completely obliterate it. Later on, I felt the feeling which was hidden behind Kalari’s words bit by bit. When Woody Allen, whom you always saw as a source of innovation, sent you a message through his sister that, as usual, he cannot - or does not want - to attend the ceremony, but would like to meet us in New York and talk about the film, it was then that I realized the true meaning of what he had already said about the film: Allen had noted that for years, he did not expect neither our cinema, nor cinema in general, to create something which would have such a great impact on him! When Thomas Langmann, the son of the famous and recently deceased French producer, Claude Berri, who is producer of The Artist and winner of many prizes, said that when everybody was lauding his film, he saw our film and he wished he had been its producer, everything made more perfect sense. When Brad Pitt said on the night before press conference of the Golden Globe ceremony that he had watched The Separation on DVD [with Angelina Jolie] and in the middle of the opening sequence at court, Angelina Jolie has paused the film after seeing the fight between the couple, has been very touched, has waited for some time and watched it again, I became more confident. When Angelina Jolie asked you about your next film and plainly said she wanted to be in your film and when you answered her by saying that your leading actress would be speaking French and she said that she could learn French by the time you start making your film, I simply felt proud. When Meryl Streep asked you about details of directing or acting in different sequences of the film and eagerly noted that she would like to work with you; when Steven Spielberg said he believed that A Separation would be the best film of the year with a wide margin; when David Fincher spent half an hour to talk to you and tell you about his viewpoints; when some famous filmmakers said they had not seen the film, but had heard a lot about it from Francis Ford Coppola and were very curious; when Alexander Payne, who won Golden Globes for the best film and directing, became your close associate of those days only due to his interest in your film and said both in the Golden Globe ceremony and in the critics session that he had been trying to send you positive energy when you were talking on stage; when other people whose names I am not allowed to mention here noted that they have put your film on the list of their favorite films of the past two or three year; I just realized what borders you have transcended and what summits you have captured in the hearts of people who see tens of great films or make one of two of them every year. During the Critics’ Choice Award ceremony, when the great Bob Dylan was performing a very beautiful piece on the stage and we were talking about the pleasure that it gave us to see and hear his performance, we were told about the amazing comments he had given about our film. This is just part of what I heard and saw. Let the rest of it remain for another time, especially what happened between you and Robert De Niro whose story I wish Mr. Kalari will tell some day. You said, “I don’t want to say that filmmaking conditions are ideal in my country, but the image you have of filmmaking in Iran is also not accurate.” I remembered your words when, amid your conversations, works and different interviews, you told me about another film which you said you were going to make in Tehran in future and that you love it very much. Another thing you said which elicited audience’s applause was when you pointed out that differences among people in various parts of the world were much fewer than their similarities, but it was more to the benefit of politics to exaggerate differences and gaps and put more emphasis on them. 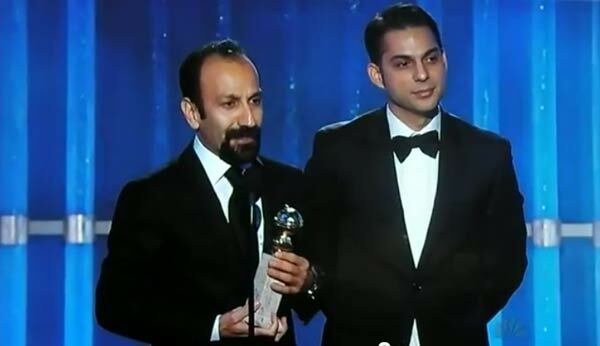 During the ceremony, I was very happy to hear your speech like millions of other Iranians. Looking from the stage, you could see how all big names of cinema whose works you had seen through your life and about whom you had read many things, were staring at you; as if the love and energy of the Iranian people had helped us to stand firm in that place. The moment that you talked about your people, I knew that millions of people in our country are staring at us and you, supported by their love, mentioned them instead of talking about your loved ones; and to tell the truth Asghar, how pleasant it was to be an Iranian up there. The value you attach to this people will become better related to you representing them when one remembers what an American critic had written about A Separation. He wrote if anybody wanted to threaten Iran, they better first watch this movie to know with what people they are dealing and change their mind. When a film has such an achievement and such an influence, it means that you have fulfilled your duty to your people even more than what you said in eulogy of your nation. Now, it is not important whether the movie wins Oscars for the best “foreign movie” or the best “screenplay.” The more important thing is how this movie has inspired this people with hope, enthusiasm, and a sense of honor. 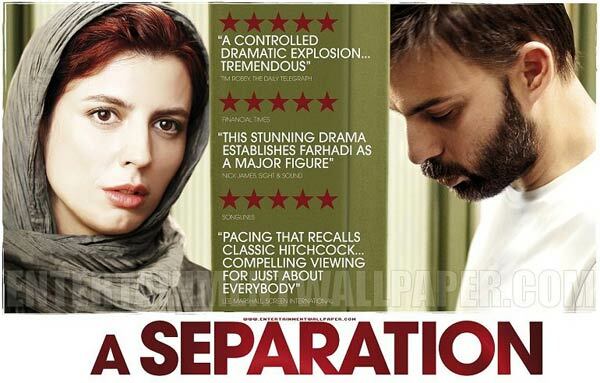 Iranian establishment questions international success of "A Separation"
Asghar Farhadi's Violation of "Diplomatic Practices"